Speech therapy involves assisting patients with speech, language, comprehension and expression. They work with people to help with memory, orientation, thought organization, voice control, and alternate non-speech communication. 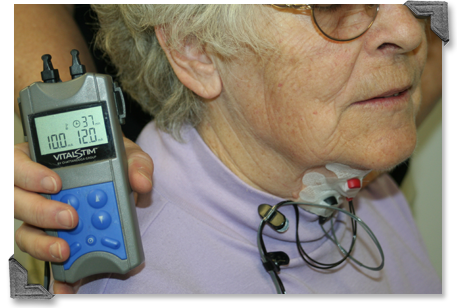 Swallowing disorders are addressed using state-of-the-art Fiberoptic Endoscopic Evaluation of Swallowing (FEES) studies and VitalStim. The services offered help patients with functional tasks, verbal expression, speech clarity, and understanding instructions. Additional services are offered to help with reading, writing, cognition or problem solving for patients of all ages. Speech therapy at CMH involves helping patients with speech, language comprehension and expression, memory, orientation, thought organization, voice and alternate non-speech communication. Disorders affecting swallowing are also treated. Therapists work with such patients to focus on safe, oral nutritional intake.